KIRKCALDY High Street was officially ‘reopened’ on Saturday when the improvements made during the year-long regeneration project were revealed for all to see. 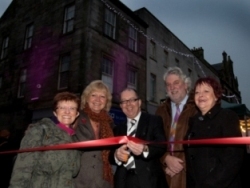 Representatives from Fife Council and the Scottish Government met with traders and members of the public on the street and marked the occasion with a ribbon-cutting ceremony and a switch-on of the new civic lighting. Since July 2010, the High Street has undergone a complete transformation thanks to a wide range of improvements to surfaces and fittings including new street lighting and a public Wi-Fi network. New coloured floodlighting to highlight the street’s historic buildings was also switched on as part of the reopening ceremony. This will complement the street’s Christmas lights which are due to be switched on during the annual reindeer parade in November. The reopening on Saturday was timed to coincide with a programme of events organised by local traders’ group, Kirkcaldy 4 All. A continental market was set up in the street on Thursday, street performers from Adam Smith College entertained passers-by all weekend and a Kingdom FM Roadshow took place on Saturday afternoon. Visitors to the street on Saturday were also treated to a special celebrity appearance from Coronation Street and Boyzone star, Keith Duffy, who was well received by the large crowd that had gathered. Statistics gathered using the on-street counters on Friday suggested footfall to the High Street had increased by 25 per cent. The regeneration of Kirkcaldy High Street was part-funded by a £2million grant from the Scottish Government’s Town Centre Regeneration Fund. The remainder of the £4million project budget – which will also see the creation of a ‘Green Corridor’ between the town’s bus station and railway stations – was funded by Fife Council and Historic Scotland. Cllr. David Torrance, constituency MSP for Kirkcaldy, commented: “The effort put in to this initiative by everyone has been tremendous. Kirkcaldy 4 All, BIDS, Fife Council and the funding of £2million by the Scottish Government have made a significant impact in the regeneration of Kirkcaldy High Street and have helped to make it one of the best in Scotland. Cllr.Tony Martin, chair of Fife Council’s Environment, Enterprise & Transportation Committee, echoed his sentiments: “Kirkcaldy is Fife’s largest and fastest growing town, with more shops than anywhere else in Fife. It is hoped that the improvements made to the High Street will encourage even more people to visit the town and make it their shopping destination of choice. On behalf of Kirkcaldy 4 All, Bill Harvey added: “The reopening of Kirkcaldy’s High Street is very welcome, especially as we are on the lead up to Christmas. MEDIA RELEASE posted by Fife Council. You too can post media releases (aka press releases) on allmediascotland.com. For more information, email here.